The annual Madison Blood Drive takes place each February at the junior high to replenish critically low blood supplies for the American Red Cross during the winter months. This particular interdisciplinary unit was created after a colleague attended the annual MAMLE conference and participated in a session put on by the Frank Harrison Middle School of Yarmouth that blended academics with community service. The sixth grade was assigned the tasks of letter writing to encourage people to donate blood as well as learning what constitutes the parts of blood. The eighth grade completed detailed presentations about the cardiovascular system, showcased activities that keep your heart healthy and made 3-D versions of human blood based on a liquid’s density. In Art classes students created clay models of the human heart that were then painted and labeled with correct names. This year a new idea was added to the blood drive called the Tree of Donors. The Tree of Donors idea began with a visual of a caricature of a tree without any leaves. Then the sixth grade students cut out blood drops to represent leaves for the tree. After donors gave blood at the drive, their names were placed on each leaf and hung on the tree. 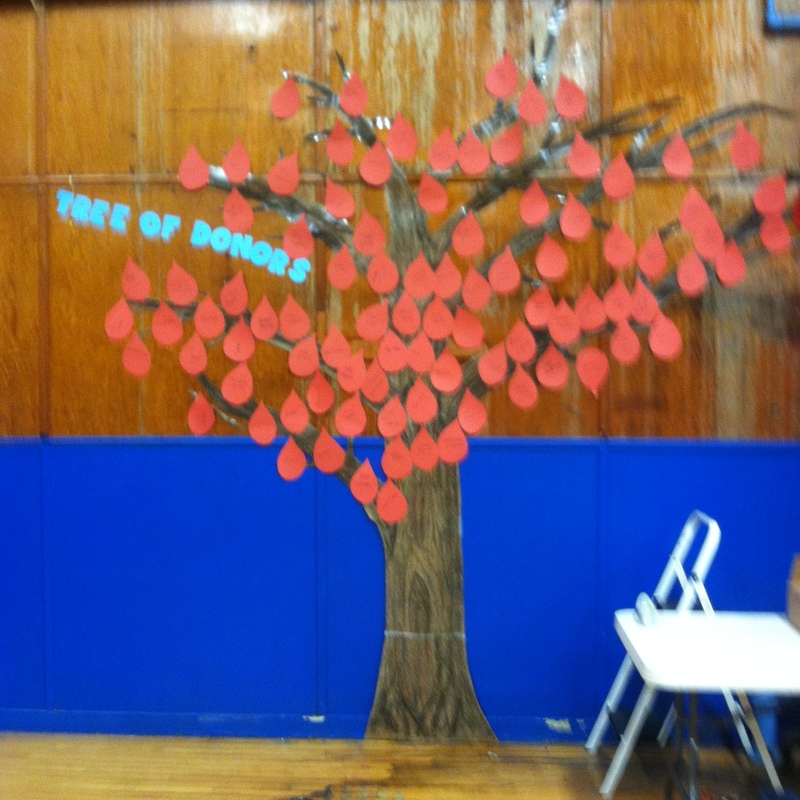 The tree symbolized the importance of each blood donor as they became part of the donor tree. Sixth and eighth grade students were vital in assembling the initial tree and adding names to leaves as volunteers gave blood that day. On the day of the blood drive, students were responsible for greeting people at the door, registering blood donors, escorting those who have given blood to the snack table, running the snack station, as well as the final break down and clean up. The Madison Junior High Blood Drive was showcased this year on WLBZ Schools That Shine segment for the academic connection to community service. This learning experience was made possible because of the MAMLE experience and resources available. This entry was posted in Curriculum and Instruction, Engaged learning, General, MAMLE, Project learning and tagged Blood Drive, Community Service, Interdisciplinary Unit, Madison Junior High School. Bookmark the permalink.